Step Attenuator suitable for 0 - 30MHz. Useful for receiver sensitivity evaluations this Step Attenuator is a series of switchable Pi attenuation pads as shown in Fig 1 schematic below. 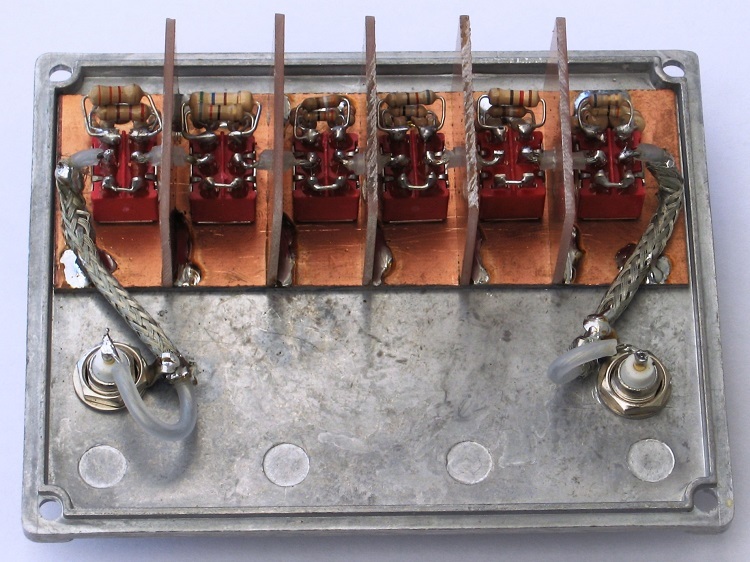 The resistance values required were derived from paralleled on hand resistors in stock. 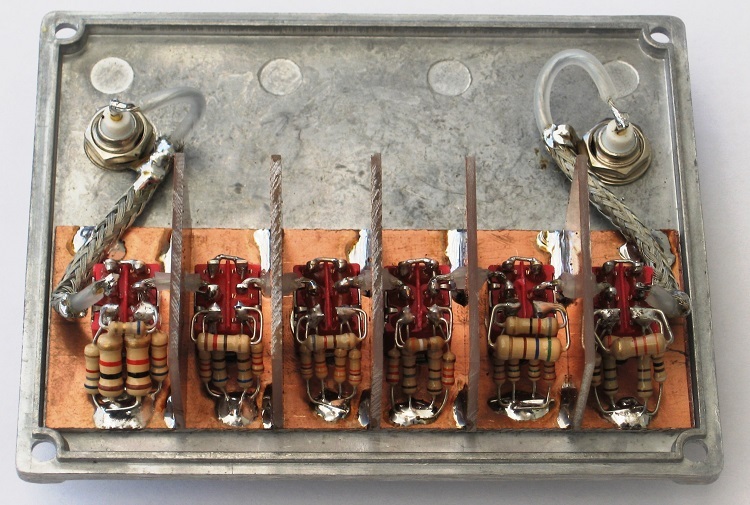 All resistors are of a 5% tolerance however should be adequate for the intended purpose. The combination of step values were chosen as they represent values that are easily for mental arithmetic however are not necessarily the most efficient combination of values. Fig 1 Step Attenuator schematic. The broken lines represent PCB pad shielding. Fig 2 Attenuation pad resistor values. Fig 3 Resistor combinations to achieve required attenuation pad resistor values. Photo 1 Bottom rear view of the assembled Step Attenuator. Photo 2 Top rear view of the assembled Step Attenuator. Photo 3 Front view of the assembled Step Attenuator. 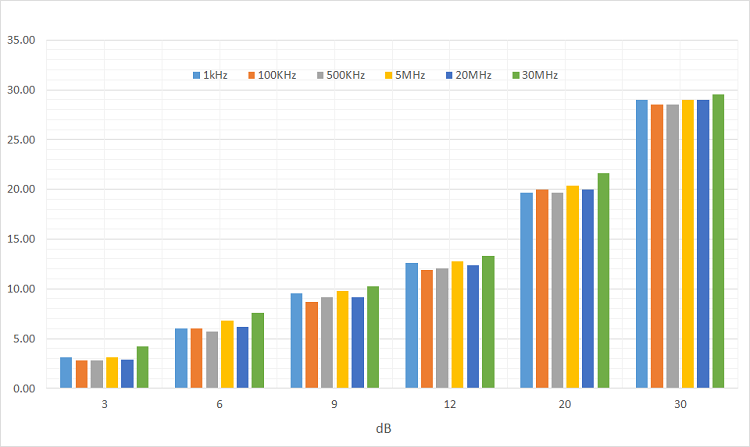 Fig 4 graph shows attenuation achieved at various frequencies. The graph in Fig 4 was derived from measuring the voltage applied to the input against the voltage presented at the output at selected frequencies. The results are applied to the below formula to calculate the dB attenuation. 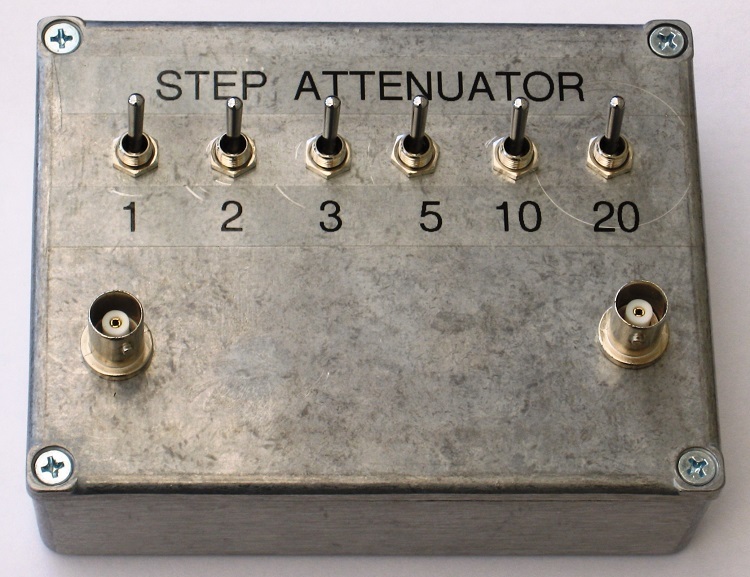 The practical use of the step attenuator is to present a precise voltage reference based on a known source voltage from a signal generator for example to measure receiver sensitivity or calibrate receiver 'S' meter. The below formula shown how to determine the output voltage from the step attenuator with an input of 10mV with the attenuator set to -6dB resulting in an output of 5.012mV. The below table gives a multiplier to apply to the input voltage and derive the output for given dB attenuation. The formula and the table are for voltage only and not power. Fig 5 dB voltage multiplier table.